In advertising, Data is king, but that doesn't always mean it's put to good use. Until now. Companies today are generating and collecting more data on their customers than ever before. This information is a cornerstone of contemporary advertising because it offers companies a way to better tailor every aspect of their content to prospective customers. This means smarter ad spending and more cost-effective campaigns. But understanding what types of data your company can collect is not easy. And how you can use that wealth of information only complicates matters. Looking at today's consumer information landscape, the easiest place to start crafting better ads through consumer information is by utilizing first-party data. Not only is first-party data readily available to companies, it can be easy to collect. And using it to boost ad revenue doesn't have to be complicated. It's about being savvy with your data and building on what you already have. First-party data is data that you collect yourself. It could be data about how your customers use your product or website, demographic data, information you collect from surveys, social data, pretty much anything that you collect firsthand yourself. This is different from second or third party data because there's no middle man between you and the information. Second party data is first-party data that is not your own. You might acquire it in a business partnership, for example. Third party data is data that you have no affiliation with but is available to you, usually for purchase. For example, an organization could buy first party data from different companies, repackage it together, and then sell it. Usually, you have little idea where, exactly, this data is coming from. If you set yourself up well, first-party data is your highest-quality, cheapest option for data collection. As software becomes more and more embedded in advertising, first-party data's role will increase. Programmatic advertising, wherein software is responsible for automating key parts of running an ad, like choosing target demographics, is already on the rise. This isn't as complicated as it sounds, tools like AdEspresso, which automates Facebook ads, have been on the market for years. “More than 50% of all US digital video ad spending will flow via automation in 2016,” and advertisers will be reliant on data to help these programs make better decisions. As much of the leg work of advertising is automated in this way, knowing more details about your consumers will allow you to maximize the power of automation. A unified view of subscriber demographic and behavior will be critical to make this strategy relevant. Consumers are already shifting to expect relevant, timely advertising across channels, and a mix of information and programming will be key to delivering this in the future. So, now that we know what first-party data is and how it's important, let's look at how you can use it to make better, more cost-effective ads. Social logins are great for both consumers and companies. With a good identity management system, they're easy to add and can be a great way to start getting serious about your first-party data. An important way that social login helps you better collect information yourself is by adding a layer of transparency. Consumers generally feel uncomfortable if they find out a company is gathering all their information to do what they will with. A prime example of this? Unroll.me selling their first-party data to other companies, like Uber, causing widespread outrage. Social logins give your consumers choice, because they can opt-in to what information they want to share. When a user signs in for the first time, you can notify them what data you'd like to receive (e.g. location, friends list) and have them check or uncheck what they feel comfortable sharing. "Social logins give your consumers choice, because they can opt-in to what information they want to share." This builds trust with your consumer, while still allowing you to get the data you need. Take, for example, the Washington Post. 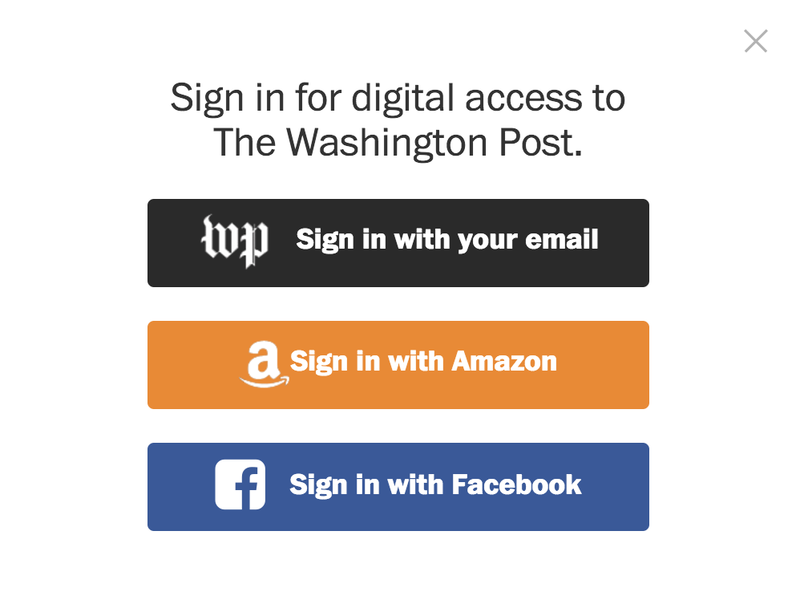 You can sign in via email, but also with your Amazon and Facebook accounts. This helps their ad strategy, because it allows them to look at what customers are interested in. What they're liking on Facebook and buying or looking at on Amazon directly informs the ads that subscribers get on the Washington Post. This kind of data could even help broader efforts, not just hyper-personal ads. As a hypothetical example, if frequent readers of the “economy” section check in to restaurants on Facebook more than any other section, then restaurants who want to advertise with the Washington Post can ask for and receive prime ad space because the Washington Post has the data to inform that choice. 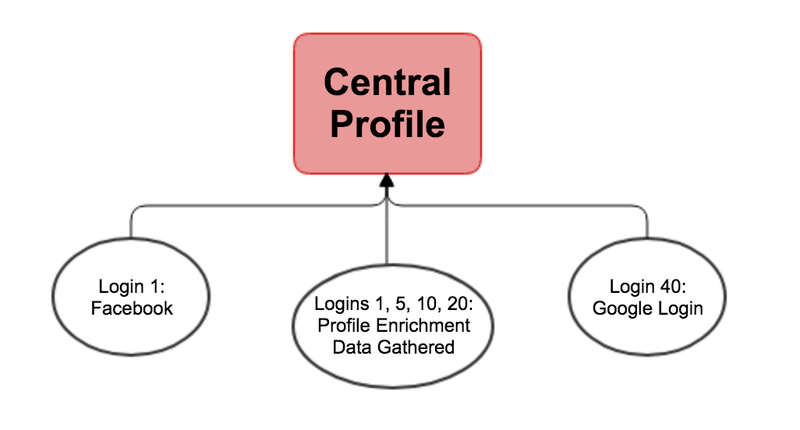 For accurate first-party data, you want every user to be associated with one profile in your system. This is where you can store information about them to draw from when making any number of decisions, so you want to make sure that it's a good representation of your customers. If someone logs in via Facebook one day and email the next, they could end up with two profiles in your system. This will skew your data and make it harder for you to make accurate insights, you need to link those accounts together into one central profile. It can also negatively impact the way you remarket to customers. If you don't have accurate information of a customer's use or purchase history, you may end up annoying them by blasting their social account with ads for things they've already purchased while logged into an account via email. Relevance and personalization are key when it comes to ads today. Nobody wants to see irrelevant ads, and people will mark ads on social as annoying or unnecessary when they get flooded by them. Some will even go so far as to use an ad blocker, which proves how impersonal and spammy ads can seem. "Relevance and personalization are key when it comes to ads today." You can cut down on irrelevant ads by linking accounts because you have a full picture in your first-party data on any given customer. This helps you serve each individual user better, but also helps you better identify trends and behaviors that you would otherwise botch because it looks like several people are doing the actions of one. Social login also allows your users to have the same customer experience when logging in across any device. This keeps your brand consistent and helps make you more customer-friendly. While retailers are still figuring out how to provide a truly seamless experience, omnichannel is the future of how you interact with your customers. You can keep tabs on users easily across channels. If they're using social login on their phone one day and their computer the next, you can keep all that information stored in their profile. All their consumer data, that first-party data you want, is consistently paired with their profile with no effort on your end. This means it's easier to serve the right ads to the right people and it's also easier to see how each individual is reacting to the ads. This feeds directly back into the personalization that's so important in digital advertising. When you're a media publisher, first-party data can help not only with how you understand your own customers, but also with how third-party advertisers access them as well. When you've collected first-party data on your customers, you can better segment your audience. Demography, common interests, device usage, likes and dislikes, among other things, can help you understand exactly what your audience wants and what they're looking for, which helps you make third-party ad placements more effective. When you have the information on your users to be able to offer more effective ads on your publication or site, that can enable you to increase your ad rate cards, which is great for your business. You can use your data to segment the ads you run by age, demographic or behavior and charge more for people that buy more, or are more suited to a particular advertiser's product. Advertisers will be more confident that their placement with you is a good fit and will provide a return on investment. And your consumers will be more intrigued by ads instead of feeling annoyed by them. It's a win-win-win. Now more than ever before, information is free-flowing and available. For advertising, it's all about harnessing the power of the consumer to give them better, more relevant content. With programmatic advertising on the rise and more user data available, working existing systems to their fullest potential with first-party data is the easiest way to get started bettering your advertising.